This document provides electrical, mechanical, and thermal specifications for the Intel® Celeron® mobile processor dual-core T1x00, Intel® Celeron® processors T3x00, and Intel® Celeron® dual-core SFF processors. The processor supports the Mobile Intel® 4 Series Express Chipset and Intel® 82801IBM I/O Controller Hub ...(ICH9M). 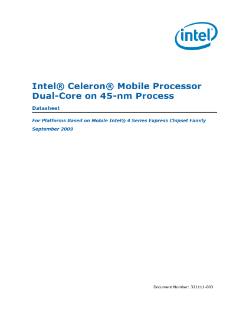 In this document, the Celeron® processor is referred to as the processor and Mobile Intel® 4 Series Express Chipset family is referred to as the (G)MCH. Read the full Intel® Celeron® T1x00/T3x00/Dual-core SFF Processors Datasheet.